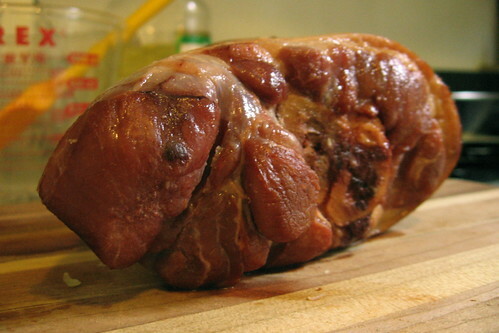 A ham hock is the end of a smoked ham where the foot was attached to the hog’s leg. It is the portion of the leg that is neither part of the ham proper nor the foot or ankle, but rather the extreme shank end of the leg bone and the associated skin, fat, tendons, and muscle. This piece generally consists of too much skin and gristle to be palatable on its own, so it is usually cooked with greens and other vegetables in order to give them additional flavor (generally that of pork fat and smoke), although the meat from particularly meaty hocks may be removed and served. I’d like to say I bought ham hocks because I’m embracing the Fergus Henderson idea of nose-to-tail eating, but it was mostly out of a morbid curiosity. I got them from FreshDirect and after a couple of days of them freaking me out every time I looked into the fridge, I stuffed them in the freezer and forgot about them. Then I wanted to make some beans. I bought The Dutch Oven Cookbook a while ago, and hadn’t cooked anything from it yet. But when I saw their recipe for slow-cooked beans needed two ham hocks, I decided to take the plunge. Bring beans and enough water to cover to a boil. Boil for one minute then let soak for an hour. Drain. Cover beans with 8 cups fresh water. Pour 2 cups boiling water over bouillon cubes (I used Knorr’s vegetable). Add everything EXCEPT tomato sauce and paste and ham hocks. Cook for 40 minutes over medium-low heat. Add remaining ingredients and simmer for 1.5 to 2 hours. I tasted this before and after the addition of the ham hocks — it was like night and day. The ham hocks gave the beans a wonderful fatty, smoky flavor. They went from blandish baked beans in a can flavor to amazing Texas barbecue sort of beans. I still don’t think I’ll be heading back for tripe anytime soon, but I might go as far as to try, say… scrapple? do more with less meat pork what do I do with this? I use smoked ham hock sections in winter or fall minestrone or pasta fagioli soup too – it gives the soups that great smoky flavor. Scrapple is not very good, in my experience, but tripe is *great*. There’s nothing like a hot bowl of spicy menudo for New Year’s Day — or any other time you’re not feeling 100%. Really: it’s worth making. Here’s a good source for the white corn posole. My God, woman! Bean soup isn’t bean soup without a ham hock to flavor it. If you can take the meat off a stewed chicken carcass then you should be able to deal with a little smoked pigs feet. And the meat in there is very good. Have fun! Pingback: ham hock! on Flickr - Photo Sharing!